CAHOOTS is a community otome game that involves buyers in development—shape the story, art, characters, etc. via vote. 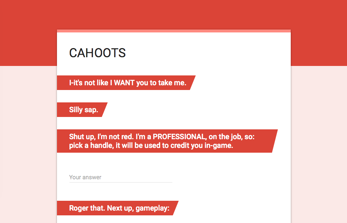 Half the updates are exclusive to buyers, for public news, check the #cahoots tag on the my main blog. 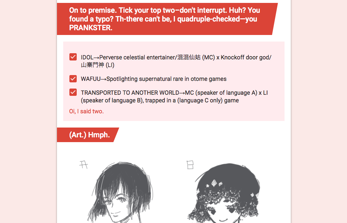 Because the project is an interactive WIP, most of this page (e.g. banner) compose of placeholders to be updated during development. There are 3 surveys. They open and close in the first and last week of respective months on Google Forms. Results will be shared on Discord the month following, and eventually on Tumblr and Twitter. JUL - Premise, gameplay, art style, UI, etc. Due to support shortage—Cahoots was less 1% funded a month into its campaign—I cannot afford set times for development, though the release date remains Q4 2018, everything in between is whenever. Cahoots will feature 1 love interest, 4 CGs, and 2 endings. Please message me on Tumblr or Twitter. I will respond within a week.